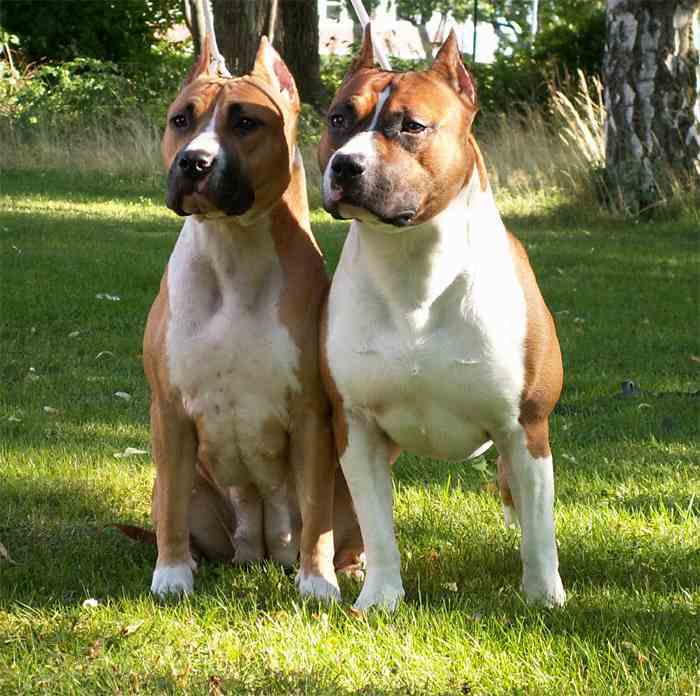 The fighting bull-and-terrier breeds of the 1800s spawned the more peaceable American Staffordshire Terrier or AmStaff. In its formative years, the breed was known as the Yankee Terrier, the Half-and-Half or the American Bull Terrier. 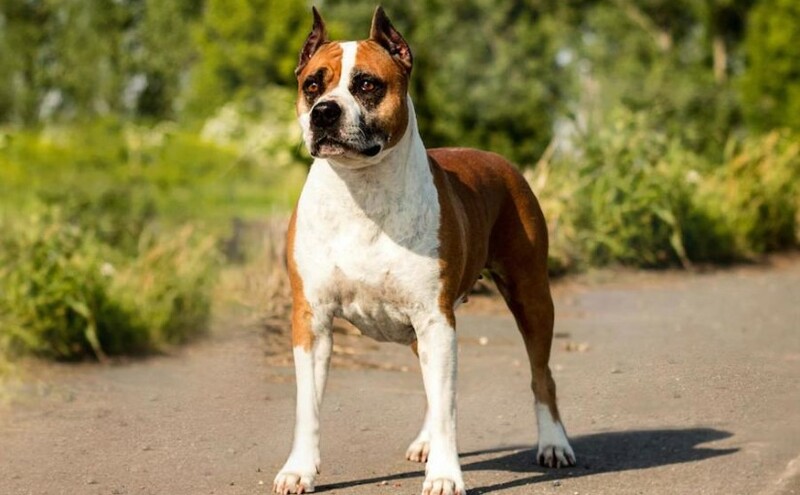 It was recognized by the American Kennel Club in 1936 as the Staffordshire Terrier but the name was changed to American Staffordshire Terrier in 1972 to avoid confusing it with the smaller Staffordshire Bull Terrier. Size: Height and weight should be in proportion. A height of about 18-19 inches (46-48 cm) at shoulders for the male and 17-18 inches (43-46 cm) for the females is to be considered preferable. Coat and Colour: Coat short, close, stiff to the touch, and glossy. Any colour, solid, parti, or patched is permissible, but all white, more than 80 percent white, black and tan, and liver not to be encouraged. Head: Medium length, deep through, broad skull, very pronounced cheek muscles, distinct stop; muzzle medium length, rounded on upper side to fall away abruptly below eyes. Jaws well defined. Underjaw to be strong and have biting power. Lips close and even, no looseness. Nose definitely black. Upper teeth to meet tightly outside lower teeth in front. Eyes dark and round, low down in skull and set far apart. No pink eyelids. Ears set high; cropped or uncropped, the latter preferred. Uncropped ears should be short and held half rose or prick. Neck: Heavy, slightly arched, tapering from shoulders to back of skull. No looseness of skin Medium length. Forequarters: Shoulders strong and muscular with blades wide and sloping. Forelegs set rather wide apart to permit chest development. The front legs should be straight, large or round bones, pastern upright. No resemblance of bend in front. Body: Back fairly short. Slight sloping from withers to rump with gentle short slope at rump to base of tail. Well-sprung ribs, deep in rear. All ribs close together. Chest, deep and broad. Loins slightly tucked. Hindquarters: Well muscled, let down at hocks, turning neither in nor out. Feet of moderate size, well arched and compact. Faults: Faults to be penalized are Dudley nose, light or pink eyes, undershot or overshot mouth, full drop ears, tail too long or badly carried. 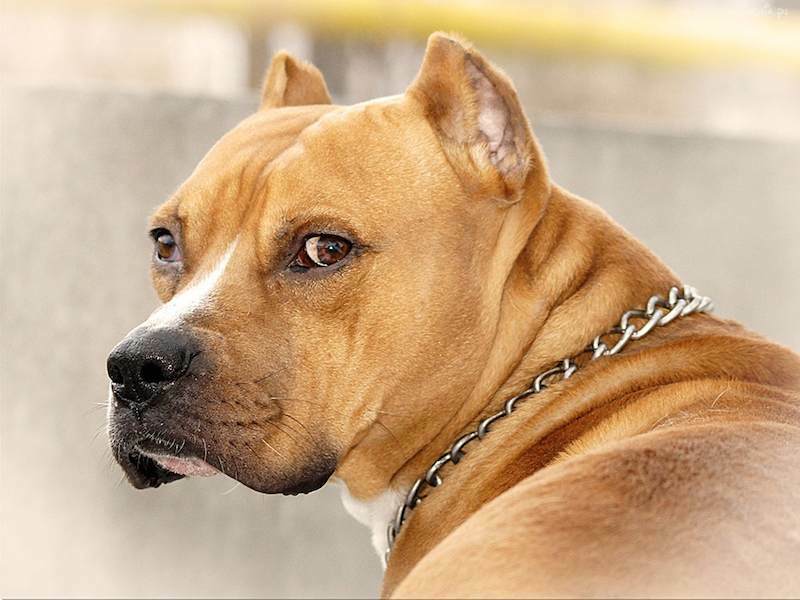 American Staffordshire Terrier vs Pitbull comparison: The Amstaff is larger, heavier, stronger and generally more muscular looking than the pitbull. The pitbull excels at agility compared to the American Staffordshire Terrier. Both have high tolerance for pain and are extremely protective of their family and property. IMPORTANT: If you are planning to get an Amstaff or a Pitbull, you must be a responsible master with a firm hand. You must learn about his body language and the signs that he is getting ready to fight or attack. This will prevent many untoward incidents.